Set amidst hundred acres of parkland, the Thornbridge Hall is a massive English Country House which is a grade-II Listed building and is known for its wonderful architecture and impressive gardens. Today, the Thornbridge Hall is a private family home as well as a venue for various events including weddings and receptions. This historically significant hall with its exemplary architecture and breathtaking gardens serves as the ideal backdrop for any occasion. 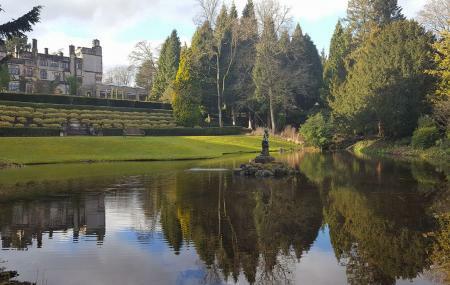 Areas of the beautiful Garden encompass the Water Garden, Italian Garden, as well as the Grottos, a 100ft Herbaceous Border, and Koi Lake amongst others. The gardens are open to the public between April and September every Wednesday and Thursday. A very beautiful house and gardens. This is a family home so you can't wander round the property but on some days of the week, the extensive gardens open to the public. There is a plant sale available with knowledgeable staff on hand. Plus a large cafe with indoor and outdoor seating serving excellent food and drink. Little gem in the Peak District. The 12 acres of formal gardens were designed at the end of the 19th century by Simeon Marshall, working for the internationally acclaimed James Backhouses & Sons Nursery. They were inspired by the vision of the owner, George Marples, to create a '1000 shades of green' to be viewed from his bedroom window. Areas of the garden include the Italian Garden, Scented Terrace, Water Garden, Koi Pond, Kitchen Garden and Orangery, amongst others. In 2017, the gardens became an RHS (Royal Horticultural Society) Partner Garden. They are open to the public on selected days between April and September. The current owners are The Hunt family who purchased the house from the Council in 1997, started restoration work to the gardens, and removed additions to the house to reveal its earlier proportions. From 2002, Thornbridge Hall has been owned by Jim and Emma Harrison owners of Thornbridge Brewery and A4e respectively, and is both a private family home and a venue for events, including weddings. The gardens are open to the public every Wednesday and Thursday, between April and September. The original thornbridge brewery was based in a converted joiner's and stonemason’s workshop within the grounds of Thornbridge Hall. It aims "to make a small range of quality cask and bottled beers using new recipes, innovative approaches and the use of local fresh ingredients". Its first beers appeared in February 2005 and have won awards. A lovely little find only down the road from where we live. Had a super walk around the gardens and then had lunch in the little cafe. We had proper home made soup which was wonderful. Stopped here during our cycle ride along the Monday Trail. Beautiful building in a fabulous setting. Plush looking coffee shop with friendly staff. Orange & poppy seed cake was delicious. Didn't have time to visit the gardens & plant sales but plenty of people did, many with their dogs which were made welcome. Abdolutely stunning venue, excellent food, beautiful orangry and grounds.